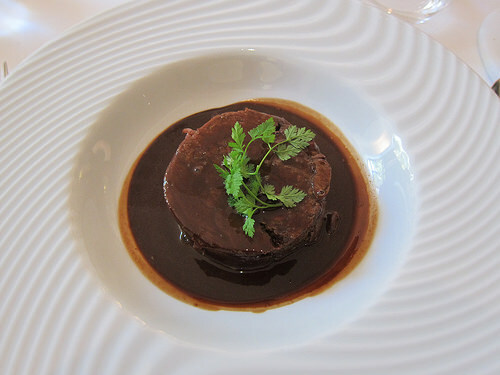 Behind the French Menu: Civet – A traditional French stew associated with small wild game. Civet on French Menus. 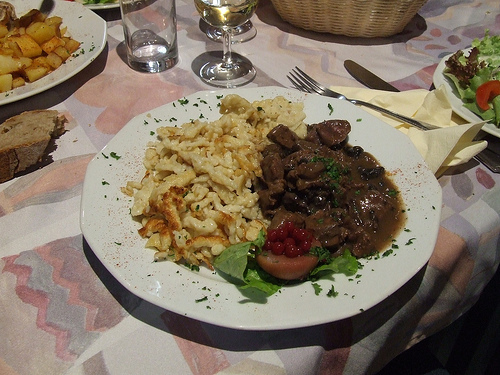 Civet – A traditional French stew associated with small wild game. Civet on French Menus. Rabbit stew with mashed potatoes. The traditional civet would be a wild rabbit, wild hare, and sometimes young, wild boar. Today the animals will mostly have been farmed, and other animals will often be prepared in a similar fashion. The traditional civet took tough, stringy, wild animals and marinated them in wine for 24 hours or more. After they were well marinated, they would be slowly cooked with lardons, bacon pieces, wine, and herbs. Most French chefs prefer farm-raised rabbits, hares and young farmed wild boars for their tables. Yes, even wild boars are farmed in France. The rabbits, hares, and wild boars are larger and meatier than those caught in the wild. They are generally available all year round for whenever the chef decides to put them on the menu. Also, the chefs’ choices have expanded beyond rabbits, hares and young wild boars. In the case of the wild boars, it is interesting that they do not even know they’re being farmed. They are kept in a large forested area where the always have enough food. A mixed litter of a farmed wild boar. 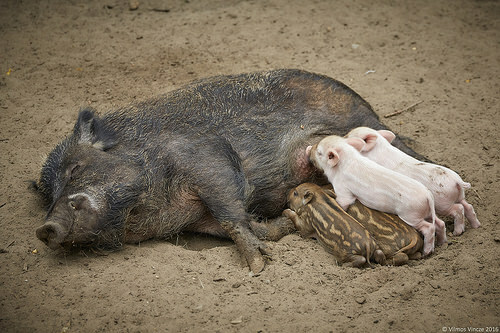 The piglets are being fostered. Civet de Chevreuil au Vin de Bourgogne – A stew of roe deer made with wine from Burgundy. Civet de Lapin – Rabbit stew. Civet de Lapin au Sang – The traditional rabbit stew cooked with some of the rabbit’s blood. 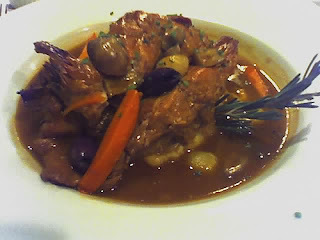 Civet de Lièvre – Hare stew. on sale in a French supermarket. 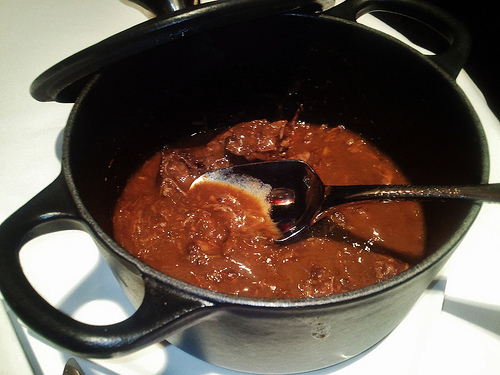 Civet de Lièvre au Sang – The traditional hare stew cooked with some of the hare’s blood. (The most famous hare dish is Lièvre à la Royale – Hare in the Royal manner. It is a dish that outside of specialized restaurants usually has to be ordered a day or two in advance. For this dish the hare, and traditionally this was a wild hare, is marinated for two or three days with thyme, cognac, and red wine and then cooked with pork, foie gras, red wine, onions, garlic, shallots, and truffles if available. Sometimes Lièvre à la Royale is mistranslated on a French menu into English as Jugged Hare. Jugged hare is a traditional English dish, and they are not the same Jugged Hare is wild hare marinated for a few days in red wine, garlic, and herbs and, then served fried with salt pork prepared in its own wine marinade. 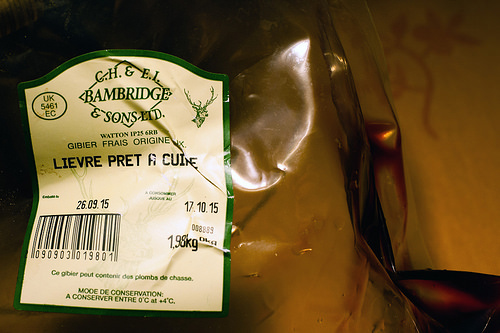 Alas, the jugged hare misses the cognac, foie gras, shallots, and truffles that are part of Lièvre à la Royale). Civet de Marcassin. - A stew of a young farmed wild boar. A wild young wild boar would be a marcassin sauvage. Civet de Tripes d'Oies – A stew of goose tripe, red wine, onions, shallots, flavored with bacon pieces and garlic. On a local menu in the department of Gers, Armagnac country, I saw a listing offering Civet de Tripes d'Oies Au Armagnac. 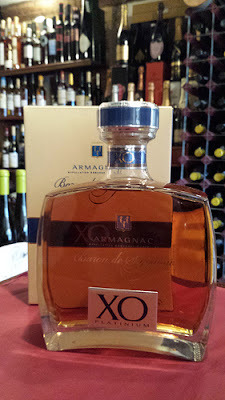 The addition of Armagnac should not be too surprising as the old province of Gascogne includes the departments of Gers. 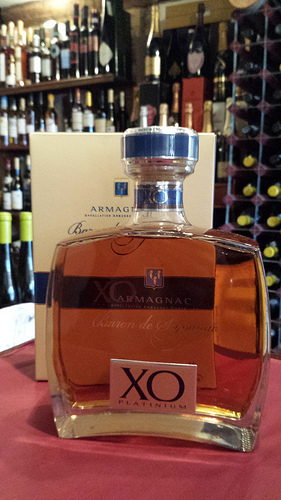 The departments of Ger, Landes, and Lot-et-Garonne are the heart of Armagnac country. Nevertheless, during the hunting season, some restaurant will be offering Menus de Chasse; a menu dedicated to wild animals caught during the regulated hunting season. If the menu only offers a single wild animal the chef will add the word sauvage; for example, a rabbit is a lapin, and a wild rabbit is a lapin sauvage. The traditional civet recipe for hares was Civet de Lièvre au Sang; that meant the hare’s blood was used to both to flavor and to thicken those stews. Chefs know that the old recipe is now considered politically incorrect, and so now many chefs add the rabbit or hare’s liver and kidneys to the stew instead and by so doing so they claim the same flavor is achieved. The stew itself will be reduced, thickened further, if required, by longer cooking, that allows the sauce to thicken without any added blood or other additives. Gibier – Wild game. Wild game in French Cuisine. Wild Game on French Menus. Rognons - Kidneys on French menus. Truffe - Trufflles. Truffles on French Menus. Truffles Oils and Truffles Essences.